Since 2005, France’s Ligue Féminine de Basket (LFB) regular season tips off with a two-day event in Paris called the Open LFB, with four games on day 1 and three on day 2. All 14 teams are present for a weekend of women’s basketball in which all seven games are broadcast live. 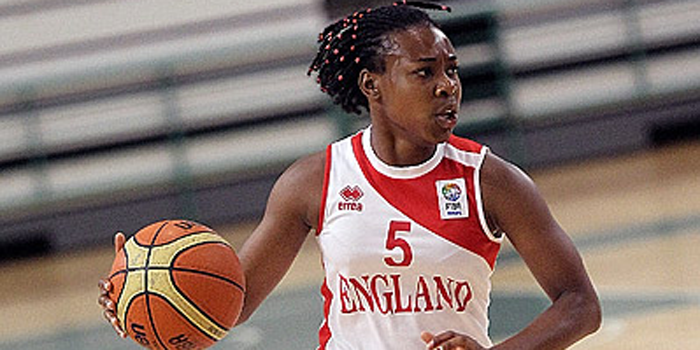 Jo Leedham (Bourges Basket) and Chantelle Handy (Nantes-Rezé) became the second and third British players, respectively, to participate in the Open LFB; the first was former Great Britain captain Julie Page who appeared twice, first in 2009 when she had played for Aix-en-Provence, and then again in 2010 with her second club Villeneuve d’Ascq – on both occasions she ended up on the losing side. Jo Leedham – by playing her game before Chantelle Handy – has the honour of becoming the first British player to play in this event and come away with a victory. Bourges Basket beat Angers (83-43), behind Leedham’s 6 points, 3 steals, 2 assists and 5 rebounds in 20 minutes on the floor as a starter. Leedham has not been able to play again this season due to injury (update – she suited up the weekend of the 27th October), so far missing three league games and one French Cup match. While she has been sidelined Bourges have continued to dominate their opponents and are just one of three teams undefeated going into round 5 this weekend. Leedham is expected to play again by the time the EuroLeague Women regular season starts in November. Jo Leedham joined Bourges in January 2013 as a medical replacement for Swedish international Frida Eldebrink. In March she picked up a bronze medal at the EuroLeague Women Final 8, and ended the season in May by winning the French Championship medal, the third British player to do so. Andrea Congreaves was the first in 2000 and Tamzin Barroilhet followed in 2009. Leedham, who averaged 8.7 points, 4.5 rebounds and 2 blocks per game domestically last season, was rewarded with an upgraded contract for this season. Chantelle Handy, who played in Greece, the Slovak Republic and Turkey since graduating from Marshall in 2010, is in France for the first time in her career. Nantes-Rezé started the season in glorious form in which they scored 50 second-half points to crush Hainaut Basket (85-50) . Handy, who started the game, finished with 7 points and 5 rebounds (box score). A short trip to third division side CSP Rezé (last season Rose Anderson played for this team) for a first-round cup game ended in a comfortable victory (85-67) with Handy contributing 12 points while shooting 50% from the floor. After the first week of glory, Nantes-Rezé are currently on a three -game losing streak that has seen them drop to 10th place in the regular season standings. Handy struggled offensively in the first two defeats but found her scoring touch in the last game as she went 4-of-7 from behind the arc in reaching a season high 14 points. This weekend Nantes take on Arras in the 5th round of domestic action and will end the month with a second-round cup game against LFB rivals Tarbes. Handy will continue to play two games a week all through November, including the EuroCup Women regular season games. Another Great Britain international in France is Dominique Allen who is playing for second division side Calais. The second division has just started and only two games have been played so far – stay tuned for updates. Hoopsfix in collaboration with womensbasketball-in-france are welcoming you to discover more about the British women playing with the orange ball. I guess this will not be a regular feature as it was not in any of your twitter feeds but nice all the same. There will be regular updates from Leslie, looking at various Brits abroad (his first one was a look at Azania, this is actually the second). I might not always be tweeting/facebooking them out instantly, but will get around to it eventually, I have too many accounts to manage! I’ve been blessed with three different contributors who are helping out with Hoopsfix Women this season – have always said I will be willing to provide the platform but need help from contributors as I just don’t have the time to do it all myself. This is the first time that people have stepped forward – the aforementioned Leslie (looking at various GB players abroad etc), Ellie (doing WNBL recaps) and Franklyn (who will be looking at Brits in the US College system). Plus the odd post from me here and there! Hopefully it can grow and we’ll see whether there truly is the hunger for it that I’ve heard from all the people on my case about lack of women’s coverage for the past few years!